This game is the best board game that I have ever played! I totally give it five stars! Five stars, this game is great! I love this game sooooooooooo much! It is my fav board game ever! I got it because one of my horse books had a review on the best horse games and there it was right at the top! I was looking for one like it and there it was. I absolutely love this game! I play it so much! My instructor, who is also a family friend gave my family this for Christmas and I love it! It is totally fun and the cards are really well animated. I would definitely recommend this game to anyone who is horse crazy. since it has small pieces, you might want to keep it on a high shelf, where no little siblings can get it. I have played it so many times. When it's Saturday my family has a fun night and we play games and stuff. Me and my brother both choose a game. So I always pick this or horse monopoly. I love this game like crazy! Fun! This game is awesome! It is so much fun and it has 3 different types of games in it. You could play it for hours! I'm missing Dusty Sun and Sand! So much fun! You can play alone too, pictures are so colorful. Me and my little brother love this game, recommended for any horse lover. I love this game! sometimes me and my sister pretend that we are the horses! my fave horses are Dusty and her twins Sun and Sand. And Rusty. This is a really fun games to play, it has three games in one. i as my personal favorite is mustang escape but the other one's are fun too. I strongly recommend this game to all horse lovers. This game is really fun to play. My favorite one is Mustang Escape. The Horse cards have good names. I use the names for my horse Models. If you Love Horses this is a awesome game for you. I love this game! I never win though. I would hate this game if i didn't love it so much! Cool my mom got me this for Christmas, and I LOVE it. 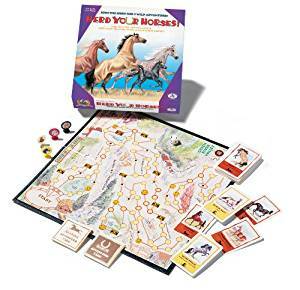 It has realistic pictures, and well made in the sense that the board and playing pieces are sturdy, and also it is easy to tell somebody who made it knows a lot about horses(FROM THE PLAYING CARDS, THEY HAVE REALLY GOOD FACTS. ), and knows what she is doing. Worth more than the price. 1 reason is that the manual teaches more than one game for the board, and includes everything YOU will ever need. It also has different levels if I remember correctly. Are always playing it. You never get bored of it. GREAT family game. If you compare this to other horse games you will see the sense of quality it has. It is not cheesy. A 100 yr old could even play it. maybe you could use it for a family or adult reunion. Mabe even a small wedding. Hard, I do NOT recommend this game for young people under 10 yrs old from playing this with my 8 yrs old sisters. Get's pretty confusing sometimes. Extremely if you don't follow the directions, and you don't have good listening ears. Pay close attention. That is one reason I think you should be at least 10. Makes a GREAT gift. this is a really fun game to learn more about horses and different types of horse jobs, this is a fun game to play. LOVE this game! Got it for christmas last year and can't stop playing it! The object of the game is to round up as many mares and foals as you can. I highly recommend it for horselovers. This looks interesting, but I'd like to know more about it. What is it like? What is the age group? I got this game for christmas in 2009 and I still love playing it! Ok You are a stallion looking to start a herd but so are your friends! The goal is to get as many Mares and foals as you can! Though you can also find other horse like animals Mules and Donkys being two of them. I love this game and play it with my little sister. We usually have to say you must get 25 horses to get to the finish because it goes pretty fast. Over all a great game!